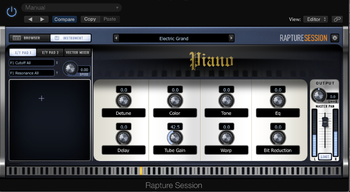 Rapture Session, Virtual wavetable synth from Cakewalk. 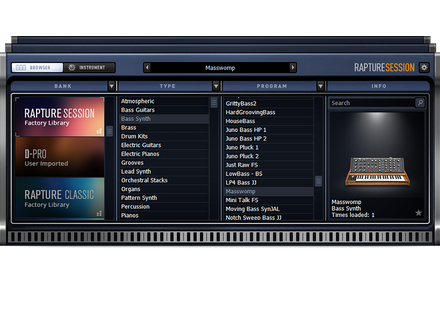 Recently, Cakewalk announced Rapture Session, a new member of its Rapture software-instrument family. It offers less sounds and no programmability, but it has the same synth engine as the flagship Rapture Pro and comes with almost 4GB of content. What makes it most notable, however, is its super-low price tag: $29.95. So is Rapture Session a great bargain or just a waste of time? We tested it recently to find out. The Rapture sound engine combines aspects of wavetable and waveguide synthesis (waveguides are a major ingredient in physical modeling). Each sound can have up to six individual sound generators (aka Elements), which can include an oscillator, sample or multisample, as well as filters, effects and modulators. The result is a wide sound palette that includes everything from sampled instruments to abstract synthetic textures and a lot more. Once you’ve purchased Rapture Session, you download and install it through a free application called Cakewalk Command Center. Because of the amount of content, it takes some time for everything to install, but the process is smooth. You can choose to load the sample content on a separate drive, if you wish, which is a very nice feature. Authorization is handled in the Command Center through a serial number — no dongles required. Rapture Session supports VST 3, AU, and AAX, so it can pretty much run on any DAW. If you’re a Windows user, you’ll need Windows 7, Windows 8 / 8.1 or Windows 10. Mac users must have at least OS X 10.8, but Cakewalk recommends 10.10 or 10.11. On both platforms, you need a Core 2 Duo processor or newer. The front page of Rapture Session’s GUI looks basically the same as Rapture Pro. But underneath, it’s missing some of the key features of its larger sibling — most notably the Elements page (programming) and the Mixer page. You do get the Browser page, which is what you see when you open the plug-in, and the Instrument page, where you can do a limited amount of sound shaping. The Browser is laid out in four columns: Bank, Type, Program (patch), and Info. Bank is where you see an icon for the Rapture Session Factory Library Bank, the Favorites Bank, and if you add some additional banks via Cakewalk’s Rapture Pro expansion packs, you’d see icons for those in the window, as well. The Type window is where you choose from one of the 11 instrument groups in the factory library. These include Atmospheric, Bass Guitars, Bass Synth, Electric Guitars, Electric Pianos, Lead Synth, Orchestral Stacks, Organs, Pattern Synth, Pianos and Strings. When you select one of these groups, you’ll see the patches for it in the Program column, to its right. The number of Programs per bank varies, but many of the banks have 50. Some, like Pianos, which had 24, have less. The final pane of the Browser window is called info, and it shows you a graphic icon and the name and Type of the currently selected program, plus it tells you how many times you’ve loaded it. While the latter is hardly something you need to know, it’s kind of interesting to see that info. A star icon on the right of the Search pane can be checked to designate a program as a Favorite. Once you’ve selected a Favorite, the Favorites bank opens in the Bank window, where all your favorites will be stored. More importantly, the Info pane also has a Search field, where you can enter an instrument type or other keyword, and if it matches any of the categories or programs, those will be displayed. This is definitely useful if you were, say, looking to see all the cello patches. Instead of having to scroll through the Strings category, they’ll all show up in the Program window, where you can audition them from. Both the Bank and Program panes can be sorted by way of a pulldown menu that each has on its right side. The Banks and Programs can both be sorted alphabetically and reverse alphabetically, and the Programs can also be sorted by most and least used. At the very bottom of the Browser window is a long thin, keyboard representation called the Preview Ribbon. You can click on notes in it toaudition the selected Program. What’s more, by holding down the shift key (or right clicking) you can select up to eight simultaneous notes, which will continue to sound until you click off of them (or they decay to silence). According to Cakewalk, if you’re using Rapture Session as a VSTi, you can record the output of the Ribbon as MIDI notes into your DAW. The Instrument page is where you can go to do some modifications to the sound, but there’s a maximum of eight preselected parameters per Program, which are mapped to the Macro Knobs. The parameters can be anything from EQ to saturation or distortion to reverb amount to filters and so forth. These can also be mapped to an external controller. 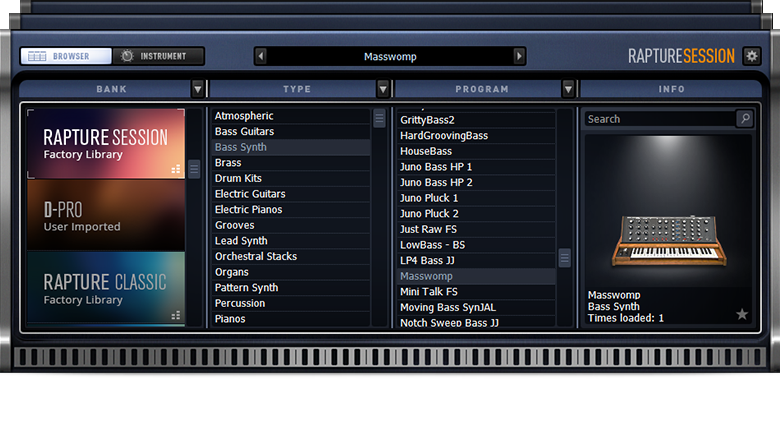 Cakewalk touts the instrument window as being designed primarily for those using Rapture Session for live performance. While no doubt they’re useful in that scenario, the Instrument window is the only place where you can do any sound shaping in Rapture Session — unlike in Rapture Pro, where you have access to all parameters via the Elements window – so it’s also important for studio use. Another way to manipulate the Programs is with the two X/Y Pads that you’ll find on the Instrument page. These let you adjust the levels of two parameters depending on where you move the crosshair. In Rapture Pro, you can choose the parameters to put in the XY Pads, but in Rapture Session they’re predetermined. In many Programs, only one of the X/Y Pads even has parameters assigned to it. Frankly, I didn’t find these to be all that useful on many programs. A more effective tool for sonic manipulation is called the Vector Mixer. It’s a hexagonally shaped field with numbers at the different outer points, representing the some or all of the parameters available in the patch (up to six). You get a crosshair here as well, which you can drag to add a gain boost to one or a combination of the Elements and thus accentuate one of the parameters. I found it pretty useful for altering sounds. Both the XY Pads and the Vector Mixer have a Speed knob that lets you slow down the speed at which you can drag the crosshair. Although the adjustable parameters and XY and Vector Mixers give you some ability to customize the sounds in Rapture Session, one big caveat is that you can’t save your alterations. You can automate the mixers as well as some of the sound parameters, however. The Instrument window also has an output section, with a master pan, master volume, and a switchable limiter, which you can use to prevent clipping at the output. Bearing in mind that this is a $29.99 synth — yes, I keep saying that, but it’s important for context — the sound selection is pretty good. So let’s talk about what you get in the various categories. Pianos: A decent variety is available here, with some serviceable, albeit not particular inspired, acoustic pianos, plus some layered sounds with strings and other instruments and even a couple of prepared pianos. Electric Pianos: If you’re looking for straight up Rhodes- or Wurli-type sounds, the pickings are slim. There are some nice ethereal sounding EPs with a lot of effects, and also an okay clav sound, but this is not the strongest category. Bass Guitars: You get a reasonable selection of different types of sampled basses, both acoustic and electric. A couple of synth basses are included in this category, even though there’s a separate one for synth bass. Finally, here’s a good slap bass called Compressed Slap. Atmospheric: These are pad-like, ethereal sounds, for the most part. There’s a wide selection of mostly spacey sounding, film-score-like Programs. Pattern Synths: A pretty good selection, mixing modern and more retro patterns. Lead Synths: One of the weaker categories, in my opinion. Here's one of the better sounds, called Moogaliciousness. Organs: Threre isn't much in the way of standard B3 type sounds in this category. There are some nice hybrid sounds. This one, called SK20 Keyes Mixed, is pretty cool. Bass Synth: There's a fair bit of variety in this category. Here are a couple of examples. 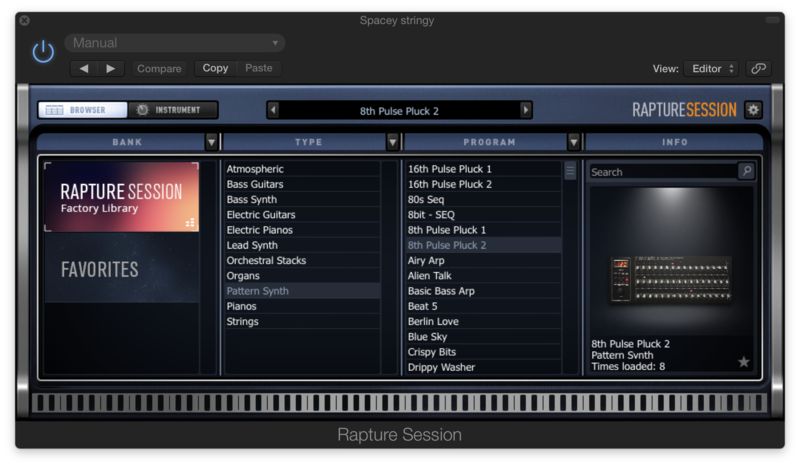 Orchestral Stacks: Between this category and the Strings category, Rapture Pro gives you a surprising amount of orchestral content. In a collection of this size, you can’t expect anything nearing a comprehensive selection, but most of the programs are good and are handy if you want to add an orchestral touch to a project. The Orchestral Stacks and Strings sounds alone are worth the $29.99 that Rapture Session costs. Strings: A strong category, featuring basses, cellos, violin and viola sections, pizzicato strings, tremolo strings, and more. Here's a section part that I put together with three different sounds from the Strings category: The melody is played by the Program Small Violin Section, the chords underneath by Full Strings ESP F, and the cellos by Cellos Long and Accent. Finally, here’s an audio example that contains only sounds from Rapture Session, with no external effects added. It shows some of the instrument’s potential. Considering its super-low price, I came into this review pretty skeptical. I must say, that for the most part I was pleasantly surprised. Although the soundset is uneven, there are lots of very usable sounds included, particularly in the orchestral area, but in many other categories as well. The biggest weak point of Rapture Session is its lack of programmability, and the fact that you can't save programs that you've tweaked with the Macro Knobs, XY Pads or Vector Mixer on the Instrument page. I also thought the parameters included for using the XY Mixers were not particularly well chosen in a lot of cases. To answer the question I posed at the beginning of the review: Yes, I think Rapture Session is quite a bargain, especially for those who are just getting into virtual instruments, or those looking to add some additional sonic flavors, and who are happy with using factory presets. You don’t have a lot to lose for $29.99, and if you like the sounds, you can always add one of the many soundpacks available, or even upgrade to Rapture Pro.